If some method were available to assess the quality of blog posts, lawyers as a group would learn more quickly and benefit more from blogs. Currently, each blog post is equal in value – however “value” might be determined – to every other blog post. My research into the blog posts of large U.S. law firms must stop at the point of quantifying many aspects of those posts; no technique exists to describe them or assess them qualitatively. Analogies to what such a qualitative method might entail come from law, academia, intellectual property, and programming. When a court’s opinion is cited frequently in subsequent opinions, we can count those later citations and infer that a more frequently-cited case has more importance than a less frequently cited case. When a professor publishes a paper, citations to that paper provide a rough measure of its quality. If other academics rely on the paper’s findings, presumably those findings have value and the higher the citation number, the more value. Likewise, when patents cite prior art and related patents, the patent applicant has made some assessment of the importance of the cited patents. Finally, if a question asked on StackOverflow has been viewed hundreds of times, you can guess that the topic is deemed important by many people. In all four of these areas, there are sources that compile the data that people want. Blog posts have no similar measures of the level of interest they raise or their evaluated worth; more’s the pity. We have looked at the blogs of the firms in this series according to their substantive legal practice area. Most of the blogs have a substantive focus, such as tax or anti-trust. But what about the sub-topics that are secondary to the substantive focus? To collect the data in the graph below, I visited each blog and either took the blog’s self-description or devised what I thought would be important sub-topics of the blog. When all those sub-topics were compiled I regularized them and then plotted the ten most frequent sub-topics. This post looks at the topics of the blogs described previously. Recall that forty-nine large US law firms host one or more blogs. 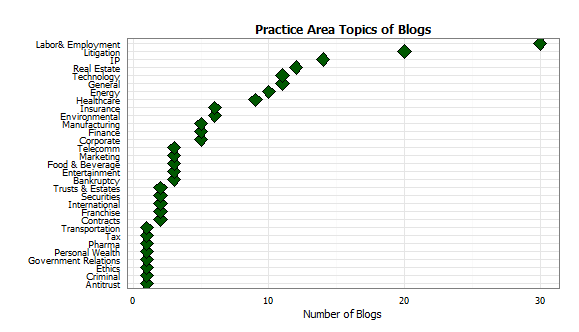 When you categorize those blogs by substantive legal practice area, you find the distribution shown in the plot below. With 30 of the blogs focused on it, by far the dominant practice area is employment law. Why? Because every corporate client (or hoped for client) has at least one employee, because a bewildering array of Federal, state, and local laws and regulations complicate employment arrangements, and because it mixes counseling and litigation. Next comes litigation, with a score of blogs addressing that practice area. Some treat the topic generally; others pick portions of the broad litigation spectrum, such as appellate practice or class actions.